Last week, I wrote about how we need to take the initiative to be involved with the church – we can’t just wait until the church comes to us, we need to go to the church. You get out what you put-in. 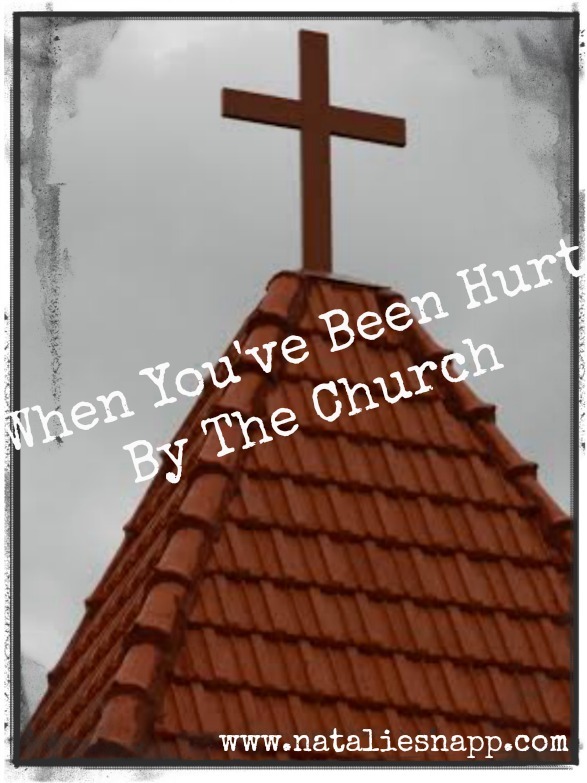 But what if you have been so wounded by the church you don’t ever, ever want to step foot in another church again? OK. Take a deep breath. Grab a coffee. Sit down. Let’s talk. A few years ago, Jason and I were involved in church leadership. Not paying positions but leaders nonetheless. For the first time, we were exposed to the inner-workings of a church. And then we realized how naive we were. We thought that just because we were with believers and those who loved Jesus, we wouldn’t have to deal with the stuff “of the world.” Stuff like egos. Pride. Lying. Gossip. Power-struggles. Because even though we profess to follow Jesus, there’s still one small problem: we aren’t Jesus. Every single one of us is disabled by the flesh. During those two years, the Refiner’s Fire instructed me through lessons on humility, grace, and forgiveness until I was shaped into a more obedient follower of Jesus. Those rough years grew me up in a way I couldn’t have without them. However, it soon became apparent. We had tried to be the change long enough. It was time to go. And in no way do I ever want to portray Jason and I as perfect people. We absolutely are not. We are disabled by the flesh just like everyone else. But I was so very troubled by the back-biting and deception happening under that stained-glass cross, I couldn’t sit there for one more Sunday. If you’ve been hurt by the institution of the church, then you’re no stranger to this feeling. If we bite and devour each other, we’ll be destroyed by each other. We are called to a higher standard than this, friends. If others see us biting and devouring each other, why on earth would they want to be involved with the church? There’s enough drama in life as is. Jesus was the only person who was ever without sin. The people who make up the church body are not Jesus. Therefore, we can conclude that those in the church body are going to sin. And if they’re going to sin, they need a whole lot of grace. Just like you and me – because if we follow Jesus, we are the church regardless if we’re a church leader or not. A dear relative once told me a troubling story about an experience he had with a church long ago. Apparently, a young man wearing a sport-coat sat at the end of a pew, nervously playing with the button of the armrest cover. That button popped off and the usher rushed to the man’s side and pulled off a button on his coat. “You don’t dare do that in our church,” the man scolded. Now do you think Jesus would do that? No, of course not. Jesus didn’t care about that stuff. But a man disabled by the flesh did it – not Jesus. And here’s where Jesus gets a bad rap by those who’ve been wounded by the church: those who are hurting blame Jesus – but that’s like blaming a mother for disciplining her child. Her child’s actions weren’t her choice and yet to this day, some people still blame mothers when their kids misbehave.